Many roofing projects run into unexpected delays and challenges that necessitate postponing of the work. The length of a roofing project will depend on several factors including the size of your home, weather conditions, the availability of materials and permits. The ultimate goal of homeowners and roofing contractors is to have the project finish on-schedule. For this to happen, you need to make the proper organization, planning, and communication. How much you are willing to spend will determine the duration of your roofing project. Some materials may take weeks for the products to be shipped and may require the services of a roofing contractor with specialized skills. If you plan to use exotic materials for your roofing project, you should be prepared for an extended project completion time. Using common materials such as asphalt shingles means your project will progress quickly. Make sure to factor unforeseen circumstances in your budget. These may result in higher costs from your end so it is always a good idea to have some extra funds to cater for any unforeseen excesses. This is another important factor. The availability of the materials you chose for your roof, flashings, vents, and accessories will definitely determine how long the project will take. Specialty material that may need to be ordered from other places will lead to delay. In contrast, common materials can be generally sourced locally, thus there is little to no delay in starting and completing the project. Always consult your roofing contractor on the availability of the materials you want and the time it will take to get them. Practically all roofing projects will require a building permit from the local licensing office before the job can begin. Ensure you get the necessary permits early enough to avoid delays down the road. Consult your trusted roofer in advance on which permits you will need for your project. Some contractors may even offer to handle all the necessary preconstruction requirements for you so your project won’t stall once it has begun. Roofing projects are an outdoor affair and therefore it will be impossible for your roofing contractor to get the job done in bad weather. The weather is beyond our control but that does not mean you can’t prepare for it. When planning your roofing project, check the weather forecast and pick a season with mild weather to avoid the risk of weather-related delays. How busy your roofer is when you want to do your roofing project will be a factor in how long the job itself may take. Roofing contractors are busiest in warmer months of spring and summer. Scheduling a roofing project at this time may mean you will wait longer than you planned for since you have to ‘wait in line’. Ask your contractor about their schedule before booking their services to ensure the job is not delayed because of other prior obligations the roofer has to attend to. Alternatively, you could schedule your roofing projects way earlier, in the less busy months. Roof replacement on commercial buildings is an expensive and cumbersome undertaking. Performing the needed maintenance and occasional repair of your commercial roof can prolong the time when it is absolutely necessary to replace it. If you learn how to spot potential roof problems at their onset, you can keep a small issue from growing to the stage where extensive roof repairs or replacement is needed. That said, detecting roofing troubles is not such a straightforward affair. Most folks only notice a problem such as water leak when there could be other serious underlying systems suffering damage as well. One of the surest and most obvious indications that your commercial roof needs repair is an interior water leak. Water leaks may stain your ceiling, walls and the floor. Water leaking in your building’s interior will promote mold and mildew development, can damage your insulation and even cause serious damage to drywall, paint, and wallpaper. Some subtle signs of a leak in your commercial building interior are if some areas have a damp smell that seems to be coming from the roof. If you notice any signs of a water leak in your commercial roof, you should call a technician to take a closer look at the problem. Your roof performs other tasks apart from keeping you safe from the elements. One of those tasks is insulation. A roof in good condition should function as an insulating material that prevents your commercial building from dissipating its warmth during winter. In the summer it should shield your building’s interior from too much heat from the outside. All the two condition above will mean your HVAC is working harder, meaning higher energy bills. Bubbles on the roof– Raised parts on your commercial roof usually means trapped moisture. Trapped moisture makes roofing materials more susceptible to wind damage. The place where bubbles form will guide you to where the water has been leaking. Failed flashings– Flashings are an important part component of your roof. They are used to protect the joints between the roof and other structures including the edges the roofing materials meet with the top of the building. Damaged flashing may allow water to seep into your commercial building. Sagging– If you notice that your commercial roof is sagging, it is a sign of an underlying problem. Previous pounding could have caused this problem. However way the problem started, it is not ideal or safe and will require immediate attention from your roofing contractor. Missing or Torn Shingles– This is another indication that your roof needs to be repaired immediately. Granules in the gutter system usually mean your commercial roof needs to be replaced. Always call a trusted and experienced roofing contractor to inspect your roof and determine if it needs repair or replacement. If you call a roof repair service, you will more than likely be unable to deal with a roofing problem on your own. It could be damage from a branch that has fallen, or you may have a leak that has developed over time. There are many reasons that you may need to call one of these professionals. There are also many reasons why the cost may vary considerably per job, and even between different roofing professionals. Let’s look at five reasons why a roof repair service will charge different prices for the services that they offer. The first reason that roofing cost can be much higher than quoted is that the damage to the roof could be considerably more than anticipated. For instance, you may have thought that it was merely a problem with shingles that have blown off, but there was actual damage to the plywood beneath. They would have to replace the plywood, something that could add more money to the total cost of the project including the cost of materials and labor. There are always mistakes that can happen when you are getting a quote from one of these companies. For example, they may quote you a price that is much lower than they can do the job for. It may have been a new person on the phone, or they may have misheard you when compiling your initial quote. There are always reasons, and they will likely provide a reasonable explanation for the much higher price. If you are working with a company that is going to provide you with an exact quote on the total cost of a job, regardless of how long it takes, you won’t have to worry about the price going up. However, if they charge per hour, they will probably give you a rough estimate as to how much it is going to cost. Therefore, if it does take an hour longer, it’s going to cost you more money, and that may not be the fault of the professionals. The materials that you need for this particular project may be much higher than initially quoted. They may not have known what type of materials were required when they quoted you a price over the phone. Therefore, there is always the possibility that the materials are going to cost more once they finally purchase them. This is a reasonable reason for a higher price from one of these roofing repair services. Finally, there might be additional repairs that need to be performed. This is unlike the first reason where there is more damage than they initially thought. This is work that will help improve the condition of your roof, preventing the same type of problem from happening in different areas. They can save you a lot of money by improving your roof in specific areas. These are the five reasons that most people will get a much higher cost for the roofing project after getting a quotation. There is typically a reasonable explanation for why these costs are so much higher. If you have any questions, you can always ask them to itemize, and they will provide you with a detailed account of what they must do and how much the new price is going to be. At one point or another, the roof is going to start leaking, and there is nothing the homeowner can do about it. Or at least, that is how the stigma goes. Just like everything else in life, the roof has a certain amount of time before it gives in to old father time. In truth, you can extend the life of your roof with more than just a few years, and it starts with prevention. If you manage to stay one step ahead of the damage, it will be a very affordable project to keep your roof in great shape for a very long time. Here are seven tips to avoid a leaking roof and necessary repairs, which help you to save loads of money in the long run. It will serve you well to call out a professional on an annual basis. And if there is something be concerned about, they should be able to point it out. In fact, they might even fix the small problem before it escalates into a bigger one. If it happens that a big storm hits and it gets you doubting the integrity of the roof, go ahead and make that call. There are certain areas of the roof that are prone to allow leaks, for example, areas where the shingles are losing or missing. You also want to keep an eye on areas where ice-dams form, as well as the skylight and chimney. And if you do suspect that one of these areas are becoming a danger, it’s better to let a professional take a closer look. Going onto the roof is not safe, and professionals are insured. While they don’t seem to do much, the gutters carry the water away from the roof, which prevents it from leaking through the ceiling. If the gutters aren’t clean and correctly installed, expect heavy rains to become a big problem. In some cases, the culprit is the attic, and infestations can easily be the cause. However, if you spot mold or algae stains, you need to take some quick action. Just like gutters, a drip edge directs water off the roof and prevents water from building up. It will also help prevent the wood from rotting. Even though the problem doesn’t look too big, you don’t want to waste any time getting it fixed. Remember, you might only be seeing a small part of a much more significant leak. The last tip can’t be overstated because you don’t want to risk injury, or losing your roof to uncontrollable leaks. Instead, spend very little to keep a professional eye on things, and save yourself loads of money down the line. So, if you believed in the stigma that a roof has to leak at some point, think again. There are a variety of exclusions involved in roof insurance and homeowner’s policies which do not cover certain areas of the home. The roof exclusions happen to be one of the more common types of exclusions. Here is a list of the roof exclusions you need to be aware of before you take out a policy. Replacing your roof will not be covered by homeowners insurance. Even though roof repairs are covered for circumstances such as leaks, the replacement of a full-roof will be something you will need to pay out of your own pocket. The age of your roof along with the layering will determine if coverage will apply. Old roofs which are 10 to 20 years old are usually not covered. Reasons behind not covering the older roofs can be compared to offering health insurance to an individual who is already sickly. There are various risks involves and virtually no hope for any profits for extending this type of policy. Even though the majority of the roof insurance based policies will cover any damage that is caused by fire, tornadoes, hurricanes, and vandalism, some exceptions will apply when it comes to events that are avoidable. For instance, if the homeowner has failed to maintain their roof correctly or has failed to stop damages that were avoidable, the coverage falls away. The repairs in regards to roof defects are in most cases covered by your insurance policy, provided that the repairs will be conducted with parts and materials that hold the same monetary value as the ones that are already present inside the roof. If you choose to make use of a better quality material or materials that are more expensive, than the existing one on your roof, you will need to cover these costs out-of-pocket. You need to read over your insurance policy very carefully for the language that will void coverage in regards to specific types of roofing materials. Most of the policies have been written in such a way that they will only cover the roofs that have been made out of a specific material. For example, the insurers will usually not cover material types such as cedar shakes or durable slate as this material is more prone to breaks or damages. Also, the roof insurers will also not provide coverage for roofing materials that are costly to repair or hard to find. In addition, a few of the latest roofing materials will also not be covered by roofing insurance policies. Even though the latest “green” and environmentally friendly roof materials may be beneficial to our environment, most of the insurance companies don’t extend coverage if these are used in a roof repair or installation. This is because the roofing insurers are more comfortable with working with the materials that they know about and are more familiar with. There is a company by the name of GAF that is extremely popular when it comes to obtaining roofing materials. It is the largest business in North America that manufactures residential and commercial roofing products. They have had nearly $3 billion in sales, and they always provide excellent quality with all of the products that they create. Here is a quick overview of the many popular GAF product selections that customers will purchase from this business. Several products are offered by this company related to residential roofing. First of all, they have the very popular Lifetime Roofing System. This will include one of their more popular items which is called Timberline Shingles. They also have designer shingles that you may want to consider. The components associated with this Lifetime Roofing System include starter strip shingles, leak barriers, roof deck protection, and attic ventilation systems. They also have a multitude of other products such as fiber cement siding, low slope roofing membranes, and insulation panels that can help lower the amount of heat lost out of your home daily. There are some contractors; however, that will not be working on residential homes at all. They will be focused solely on commercial roofing projects. They have many roofing products designed just for commercial buildings, many of which you can use on the jobs that you are doing. The commercial roofing products that you will have access to will include asphaltic accessories, insulation, primers, sealants, and modified bitumen roofing options. They also have professional resources available for commercial property owners, architects, and property managers. You can sift through the many different commercial roofing products that they have available which will include various systems and accessories. This could include insulation cover boards, liquid applied membranes, and built up roofing systems. How Do You Get Access To These Products? You can get access to all of these products by doing a couple of different things. First of all, you will be able to find them at local stores. Second, you can go to their main website to learn more about the products that they have and where they are available. Since they are the largest manufacturer of these products, it is likely that you will find them in the largest cities, and even small communities. Whether you are working on a large residential project, or a commercial project, there will always be a business that will have some of these products available. As you look through the many different GAF products that are available, you will quickly find a few that will be exactly what you need. If you are a contractor, or if you are someone that is going to do your own home, you will have no problem locating every product that you can use for your residential or commercial jobs. Whether you are doing a roofing project that is simple or one that is extremely complex, you can always count on the products that GAF to provide you with the quality and longevity that you need. If you have recently gone through a powerful storm which caused damage to your roof, you will need to have this repaired as soon as possible. It could be the result of lightning, a branch falling, or even hail which has hit your roof. Regardless of why you have damage, it’s always good to have the number to a company that can provide you with emergency roofing repairs. Until they get there, there are a few things that you might want to consider doing to minimize the damage that can occur, especially if it’s continuing to rain. If you have recently purchased a tarp that you can use in such a situation, you should throw that up on top of the roof as soon as you can. It is recommended that you go up when it is not raining to minimize the possibility of falling off. If you are in a one-story home, it’s not as difficult. You can secure the tarp using nails from your last roofing job, and this can stay there until the professional roofers arrive. If you do not have one, you should purchase a tarp as quickly as you can and make this temporary repair to prevent water from getting in. Sometimes the problem is easy to fix such as replacing missing shingles. Most people will have leftover shingles from the previous roofing project. You will simply need to get a ladder, hammer, and roofing nails so that you can do this repair quickly on your own. Just make sure that you are inserting the shingles underneath the ones that are already there. This will allow the natural flow of the water to go all the way to the bottom and not inadvertently come in through the wood. If there is a crack as a result of a branch, you can cover this very quickly with additional shingles. If you have had damage to the actual plywood underneath because of a branch or any other heavy object, it may have cracked the sheet of plywood necessitating an immediate repair. You can use existing plywood that you have to place it up on the bottom portion of the roof where the crack is and nail it in, being careful not to pierce through to the other side. You can then caulk around the edges and then go up to the top to either place a tarp or replace the missing shingles. Once this is done, you can rest easy knowing that, if it continues to rain, you are minimizing the amount of water that will be coming in. These are things that you can do if you cannot find a roofing repair company to come out right away. You need to find as many emergency roof repair services in your area, long before you ever need to use them. Once you have found several of them, you can evaluate them based on price and reputation on the web. They will be on your cell phone, allowing you to call them for help. If there is going to be a delay, use the strategies outlined to prevent water from seeping in until they arrive. If a storm passes by, you might end up dealing with an unwanted problem. This problem is going to be none other than the sight of missing shingles. It happens all the time and is something that’s hard to avoid at the best of times. You will wonder what the next step is in a situation such as this and that is an excellent question to ask. In general, the first thing you should be looking to do is change your mindset. The structural integrity of your roof might be in question after a storm. Many property owners look at the surface and notice a missing shingle. 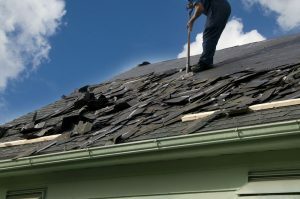 Yes, you are missing a shingle but what about the underlying damage that is not visible to the naked eye? You want a trained contractor to come in and make sure the rest of the roof is okay. If not, you need to make changes and ensure things are working out for you moving forward. Too many people don’t speak to a roofing contractor, and that is a real issue. This is a tip you want to consider if you are missing shingles. Make sure to replace them. There are times where you might be able to pick a few up and keep them in your possession. Instead of putting them back into place, you want to replace them with new ones. This is a far better investment and is going to ensure you are not dealing with a ruined shingle. Experts always recommend putting in new ones because that is a far better investment on your end. In general, when the shingles are missing, you are going to have other parts of the surface that give out too. In fact, many property owners state the corners tend to fade or lose integrity. This means as soon as another burst of wind comes your property’s way, the corners are going to get damaged or give out. To ensure you are not left with future damages, you want to get the corners reworked as well. This is going to require a professional to ensure they know what to do in such a situation. These are the tips you want to incorporate into your plan while replacing missing shingles. Yes, this isn’t a fun situation to be in and is not an investment you want to be making, but it can happen to anyone. Think about this as you are planning for the future and get on top of this before another storm comes your way. If you leave it in its current state, the rest of the roof is exposed to future damage, and that is going to lead to an even bigger bill! Take care of this as soon as you can. Most homeowners automatically assume that a simple leak or a missing shingle is a reason to go all out and have a brand new roof installed. The fact of the matter is that minor repairs can easily be carried out by professional roofing contractors without the need to spend your savings on a new roofing system. However, certain situations may arise where a new roof is your only or best option. How old is your roof? Knowing that your asphalt shingles are older than 20 years, you may need to start thinking about a brand new roof. Experts all agree that most roofs last up to 25 years if they’re well taken care of, and most warranties cover the roof for a limited amount of time. If your roof isn’t adequately ventilated or installed over an existing layer of shingles, you may need to invest in a new roof quicker. There are numerous ways that you can spot damage to your roofing shingles. First, always check the portion of your roof that receives the most direct sunlight, and if you see that the shingles are curling or buckling, it’s a good sign that they’re past their life expectancy. However, in some rare instances, it could also be a sign of inferior roofing materials used, and it may still be under warranty. The valleys of your roof are the most important places to check out. If any shingles are damaged or missing, you will need to invest in a new roof. Bear in mind that your roof’s valleys are the spots that lead water and snow into your gutters, and when they incur damage, it could be the end of your roofing system. A much simpler way of gauging the condition of your roof is to take a look at the gutters. Do you notice shingle granules inside of your gutters? Towards the end of their life cycles, asphalt shingle roofs tend to lose more and more granules. When looking at your roof as a whole, if you notice darker or inconsistent coloring throughout your roof, it could be a sign that the shingle granules have worn away. Though it may be dangerous for some, you can test the condition of your roof by walking on it. If you notice that your roof has a “bounce” to it or feels spongy beneath the surface, it could be a sign that the decking underneath has suffered long-term moisture damage. Check your attic space (if you have one), and see if you see daylight peeking through the slats. It’s also essential to check for moisture damage in the insulation! Having a properly functioning roof is a necessity that no homeowner can deny, and it’s important to check your roof for damage regularly. In some instances, simple repairs are more than enough, but there does come a time in every homeowner’s life when they need to start thinking about a brand new roof.